Verilog-A is the analog-only subset to Verilog-AMS. It is intended to allow users of SPICE class simulators create models for their simulations. Verilog-A models can be used in Verilog-AMS simulators, but in this case you would be be better served in most cases by using the full Verilog-AMS language. However, an initial step in learning the Verilog-AMS language is to learn Verilog-A. Verilog-A, like Verilog, is a hardware description language. As such, it is quite different from programming languages. There are similarities of course, and knowing a programing language will help you to understand Verilog-A, but hardware description imposes much different goals and constraints on a language then general programing, and results in a much different language, one that might seem quite strange when unfamiliar. Unlike Verilog, which is a language intended to describe digital hardware, Verilog-A is intended to describe analog hardware. As such, Verilog-A is much different from Verilog, and may seem quite strange to anyone comfortable with Verilog. Verilog-A is designed to describe models for SPICE-class simulators, or for the SPICE kernel in a Verilog-AMS simulator. SPICE simulators work by building up a system of nonlinear differential equations that describe the circuit that they are to simulate, and then solving that system of equations. Unlike in Verilog, the equations cannot be solved one at a time. They are a simultaneous system of equations that must all be solved all at once. Thus, one way in which SPICE differs from Verilog, in SPICE a solution point requires that all components be evaluated and all of the equations solved. This results in a SPICE representation of a circuit being much slower to simulate than a Verilog representation. A module is a unit of Verilog code that is used to describe a component. In Verilog-A, as in Verilog, a circuit is described with a hierarchical composition of modules. In addition, both Verilog and Verilog-A allow built-in simulator primitives to be used in the circuit description. In Verilog, those built-in primitives generally describe gates. In Verilog-A, the built-in primitives describe common circuit components, such as resistors, capacitors, inductors, and semiconductor devices. A module that simply refers to other modules is often referred to as a structural model, or a netlist. Conversely, a module that uses equations to describe a component is referred to as a behavioral model. A module may contain both equations (behavior) and instantiations of other modules (structure). It also may contain neither, in which case it is referred to as an empty module. SPICE uses Kirchhoff’s laws to formulate the circuit equations. In particular, it uses Kirchhoff’s potential and flow laws that are generalization of Kirchhoff’s voltage and current laws which extends these laws to voltage-like (potential) and current-like (flow) quantities. Kirchhoff’s potential law says that the sum of the potentials around any loop must be zero. Kirchhoff’s flow law says that the sum of flows into a node must be zero. SPICE combines the equations of the individual components with equations representing Kirchhoff’s laws to formulate the system of equations that it solves when simulating the circuit. The flow onto the node must always sum to zero. The potential on a branch is equal to the difference of potentials of the nodes to which it is connected. The flow into one end of a branch is always equal to the flow out of the other end. The first line defines the name of the component, in this case resistor, and the pins, which are nodes that the component shares with the rest of the circuit. Pins are also referred to as ports or terminals. In this case the pins are t1 and t2. 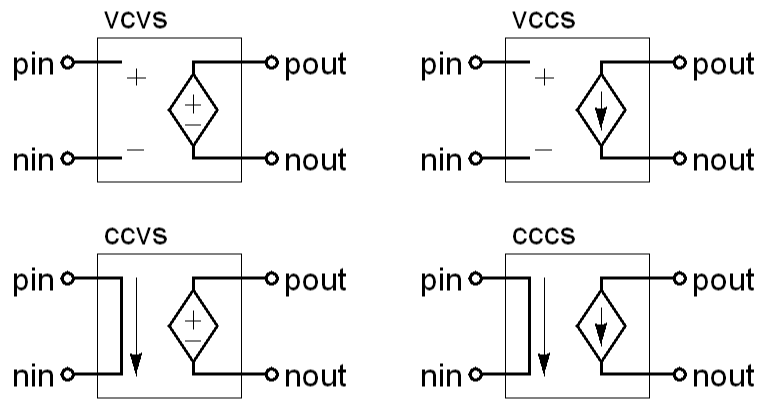 The second line declares the pins as being electrical, meaning that the potential of each pin is a voltage and the flow into the pin is a current. Verilog-A defines the flow on the pin to be positive if the motion is into the component. The third line declares a parameter (r) for the component. Parameters are values that can be specified when you instantiate the resistor (when you place a resistor into your circuit). The value or r given in the parameter declaration is the default value of the parameter, it is the value used if no value is given during instantiation. Parameters are treated as constants within the module, meaning that the value of r cannot be changed from within the module. The fourth line declares a branch named res and indicates that it is connected between the t1 and t2 pins. The branch voltage V(res) equals V(t1) - V(t2), the difference in the voltages on the two terminals taken in the order given. Thus, the branch voltage is positive if the voltage on the first node listed in the declaration (t1) is greater than the voltage on the second node listed. The current of the branch is accessed using I(res). It is positive if the current flows from the first terminal specified when res was declared (t1) to the second terminal specified (t2). At this point we have completed the topological portion of the description. The nodes and branches have been declared and arranged. We now know that there are two nodes, t1 and t2, that are shared with the rest of the circuit, and that there is a single branch, res, that connects t1 and t2. Use of the contribution operator (<+) makes this a contribution statement. It specifies an equation that must be satisfied by the simulator. 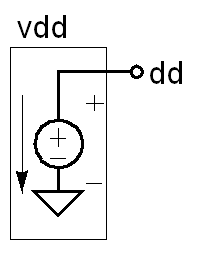 It states that ‘the voltage on branch res must equal the current through that branch multiplied by r.
In this case the resistor branch is created implicitly by combining t1 and t2 in the same access function. The voltage on t1 is greater than t2 if a positive value is contributed to the branch. The current on the branch is positive if it flows from t1 to t2. The only way to affect the larger circuit is through branches. You can explicitly declare branches or create them on the fly. Whenever you do you must specify the terminals or end-points of the branch. Branches always have two terminals, but only one need be specified. If there is only one terminal specified, the one not specified is taken to be the second terminal and it is connected to ground. Voltage on the branch is positive if the voltage on the first terminal is greater than the voltage on the second. Current on the branch is positive if the current flows from the first terminal to the second. In this case each component has its own branch, and the topology is defined by branch declarations rather than behavior of the contribution operator. There is one thing that is interesting about this model: it uses two branches but only describes the behavior of one of them. If a branch is employed but no behavior is specified for the branch, its behavior depends on how it is used. 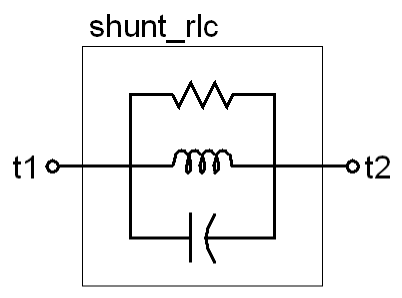 In this case there are input and output branches, pin,nin and pout,nout. Behavior is given for pout,nout in the contribution statement. The behavior for pin,nin is not explicitly given in a contribution statement. In this case the default behavior is used. There are two possible default behaviors. If the potential of the branch is observed anywhere in the module, the flow is assumed to be 0, making it an ideal potential probe. If instead the flow of the branch were observed anywhere in the module, its potential is assumed to be 0, making it an ideal flow probe. It is illegal to observe both the potential and probe of a branch unless the behavior of the branch is explicitly specified with a contribution statement. It is not necessary to add the asterisk to the beginning of each line inside the comment, but it is a widely used convention to do so in order to emphasize the fact that those lines are being ignored by Verilog-A.